Monteverde and Santa Elena make not only some of the most popular tourist attractions in Costa Rica; they also offer ideal relocation spots for expatriates. The combination of mesmerizing landscapes and an active community draw in newcomers and returning visitors on a regular basis. 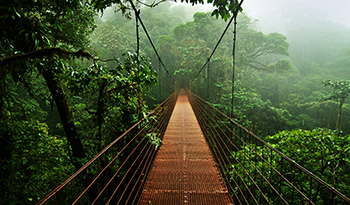 A home in Monteverde or Santa Elena makes investing in Costa Rica’s natural beauty easy. Thanks to conservation efforts and conscientious community members, Monteverde and Santa Elena continue to maintain their charm and beauty. Within the community of Santa Elena, a variety of real estate offerings can be found. Condominiums and contemporary homes make comfortable living among the area’s incredible wildlife easy. Lots are also available to construct dream luxury homes. Vacation rentals throughout the region typically offer comfortable bedrooms, kitchens or kitchenettes, and dining areas with views of howler monkeys and mountain landscapes. In between Monteverde and Santa Elena lies Cerro Plano. Here, you’ll find rustic style houses, nestled among cabins and boutique hotels. Many Costa Rican natives and Quakers make Cerro Plano their home along with expatriates. Lots, farms, and homes can be found for sale in Monteverde. Like Santa Elena and Cerro Plano, homes are generally rustic style and multi-leveled. Houses can be found near walking trails and main roads for easy transportation routes.